The 3D printing revolution continues with pens that can sculpt with extruded plastic in any shape, size, and place you choose. The 3Doodler Pen is a great example of just how creative this technology is getting, but it’s not the only product of its kind on the market. 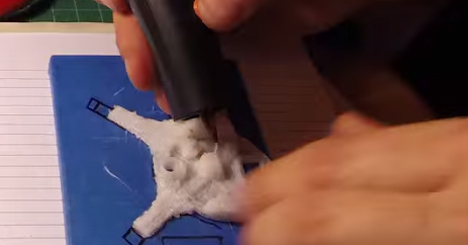 A man called Matt Quest set out to create a working remote control toy with a 3D printing pen called 3DAir Pen – and he did it with amazing results. 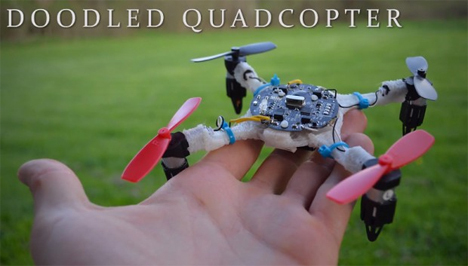 By using a small template and sheer ingenuity, Quest formed the body of his quadcopter with a 3D printing pen. He affixed electronic components and rotors taken from another mini-quadcopter. In about two and a half hours, he completed an awesome little machine that could actually fly. The time-lapse video above shows the entire process from beginning to end. The quadcopter’s builder makes it look simple, but he obviously has some previous skill in putting things together. Products like the 3DAir Pen and 3Doodler are making it easier every day for would-be artists, tinkerers, and makers of every type to experiment and play to their hearts’ content. We predict future generations of engineers who grow up building their own toys and gadgets and learning in the process. See more in Do It Yourself or under Technology. June, 2014.